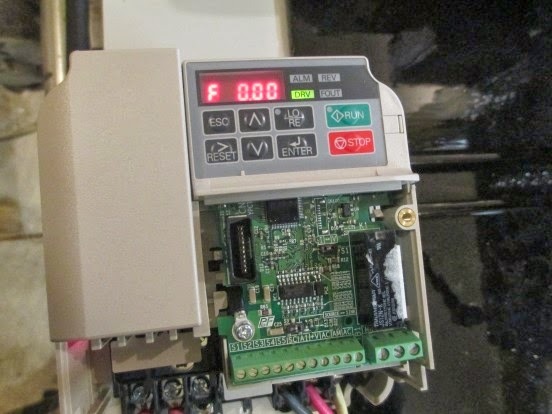 Will a washing machine motor work? I just finished my grinder based on yours and it is a beast. I used square receiver stock for the frame. A little expensive, but the inside/outside diameters were a perfect fit with no slop. I used a 1 1/2 Hp motor from an old Taiwanese Delta table saw clone. The shaft is a little short, but the 5/8 bore, 4” wheel I purchased from Oregon Blademaker seems to be very secure. Your diagrams and descriptions were great. The only trouble I had was lining up the motor mount bolts. This is incredible. I will be beginning this build soon. I have access to a full machinists shop so hopefully it'll go fairly easy. Seemsn no longer to be active. Any idea of a new site? Try looking for a diesel idler. I have a bench Grinder which runs at 2800RPM (As mentioned earlier) but the motor is only 0.25hp. Thought about using this instead of buying a motor. What does this do to my build? Hi Dan, thanks a lot for your work, you improve the hobbyist knifemaking world a lot. 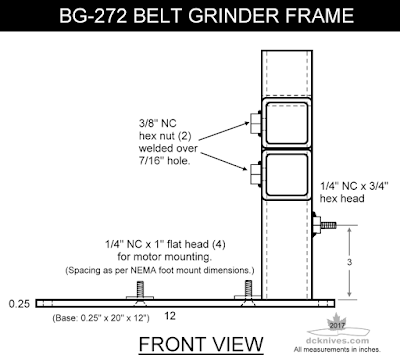 I'm planning to make the BG-272 instead of the Sayber OSG because I dont have the money, but I want to make it tiltable. Are there any reasons not to weld on a hinge like on the OSG ? Or would it be better to have the table pivot like shown in the Gallery of builds ? I'm using a C-face motor if that matters. the present time comments are not loading? Why I wonder? Hi, I noticed that comments were not appearing but couldn't put my finger on why. Thanks for your post as it sparked the investigation into why. I understand that Blogger only does 200 comments on a given post and then it craps the bed. So sorry about this. But it's pop-up comment window moving forward. 1. I have found, that in respect to frame parts A,B and C, if 1/4" wall tubing is used AND the inner weld seam is cleaned up, that 1-1/2" tubing (I have 1/8" on hand for fitting purposes only)fits perfectly and will slide with hardly any slop. Will this cause any fit problems further into the build? 2. I have a large sheet of 1/4" thick aluminum that would be perfect for the D-plate. If I used this in lieu of the .188 thickness recommended, would I encounter any fit or operational issues? You shouldn't have any issues with the 1/4" thick wall. I've seen about 100 made with 2" with 0.25" wall. Not a problem using the 1/4" aluminum for a platen plate. 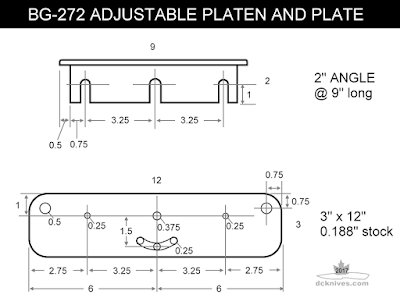 You can compensate for the extra 1/16" by reducing your platen wheel spacers. What's key is that the wheels are in a line when you're done. 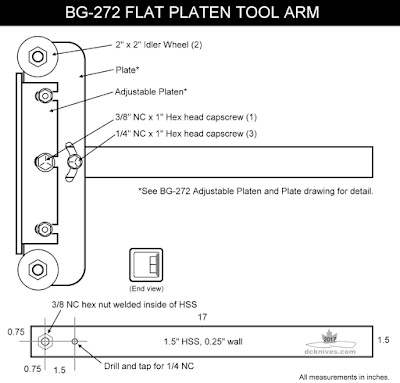 Having the platen adjustable allows one to square it 90° to the work rest table. 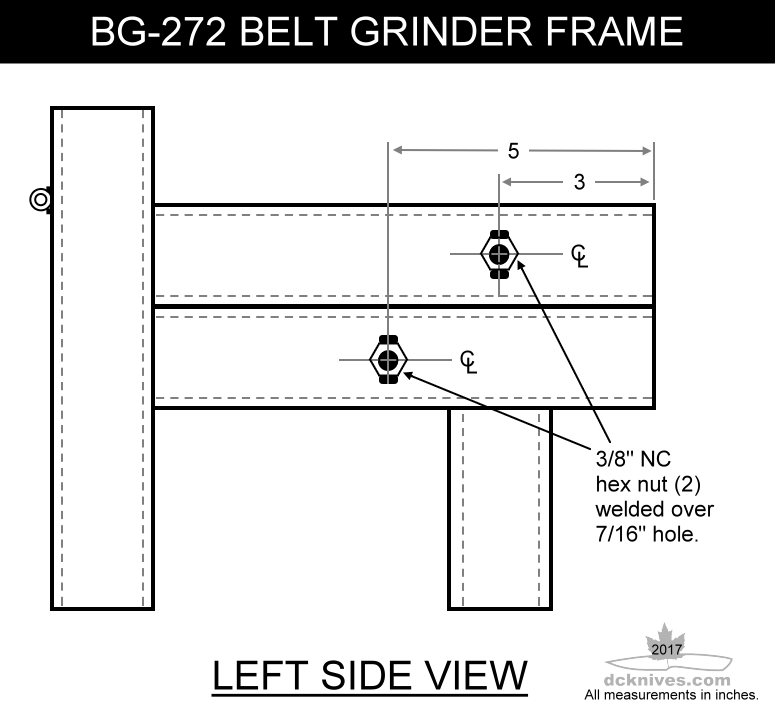 This is useful when using grinding jigs. I appreciate all the effort that you have put into both your design and also the comprehensive information you have included on your site. I have one question about the frame and perhaps there is an obvious answer that I am overlooking. 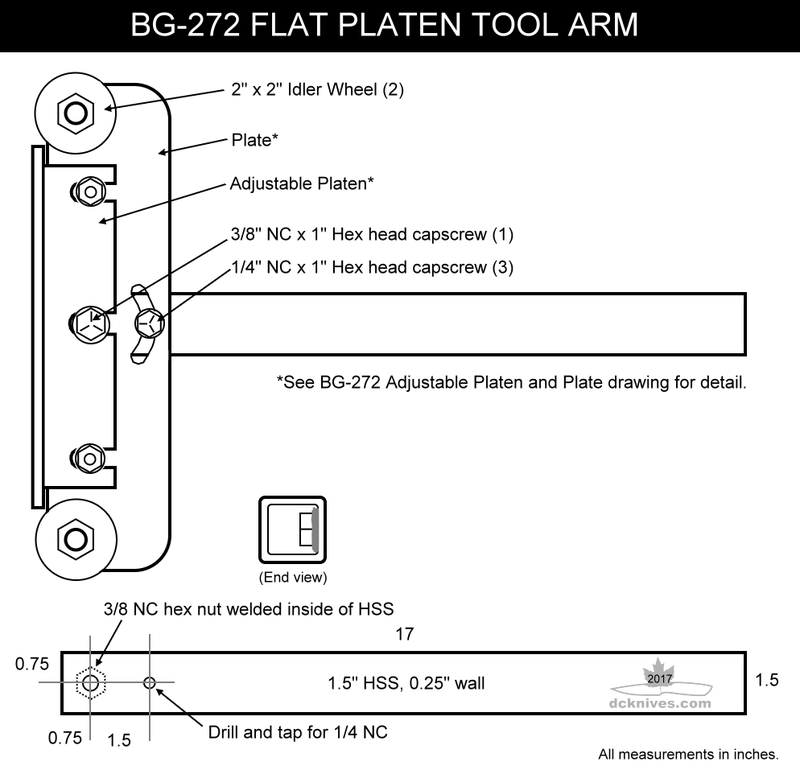 From your diagram and parts list, it is clear that horizontal piece "A" is needed to complete the frame and act as the receiver for the platen tool arm but what is the purpose of horizontal piece "B"? 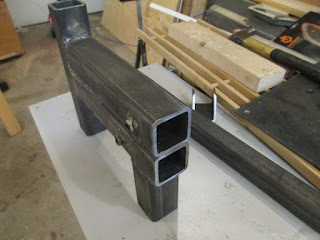 I could see its use if one were to build a tool rest that required "B" to act as a receiver for that rest but in your design, the tool rest arm is mounted to the bottom of the platen tool arm. 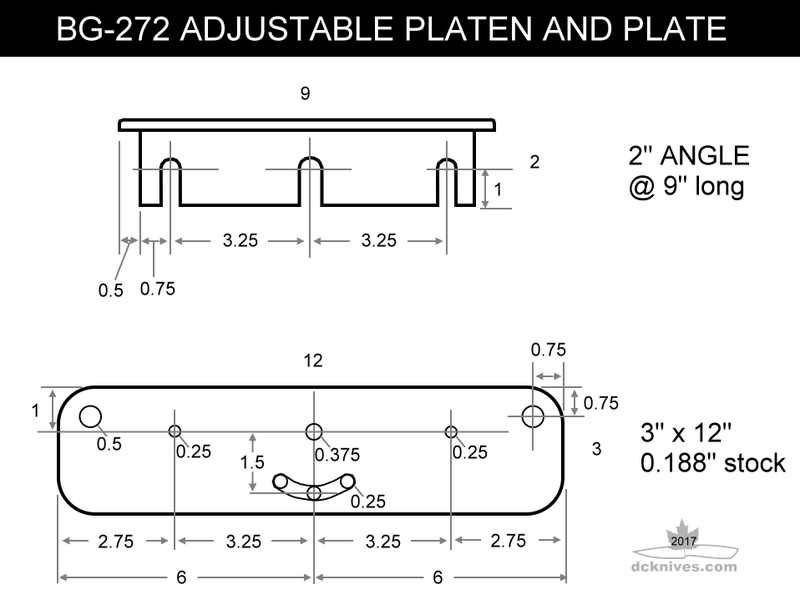 Could you not have eliminated piece "B" and installed part "D" as a 6in. piece instead of a 4in. piece or would that have compromised the function of the tool? 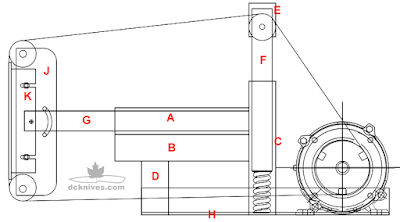 This design is known as a "two arm grinder" where the upper receiver is normally use for the platen or large wheel and the lower receiver is for the work rest. It could be any other fixture you want to add at a later date. I use it for the work rest, but others have used them for grinding jigs, surfacing attachments, work lights etc. Any configuration, whether it's a one arm, as you proposed or two arm it will work fine as long as the members are welded squarely. Hello, I am building your grinder and want to purchase https://www.ebay.com/itm/231396771672. Will this size wheel work? I am very new to building items. That's an excellent wheel set, but your motor MUST have a 5/8" diameter motor shaft to work with this particular drive wheel. 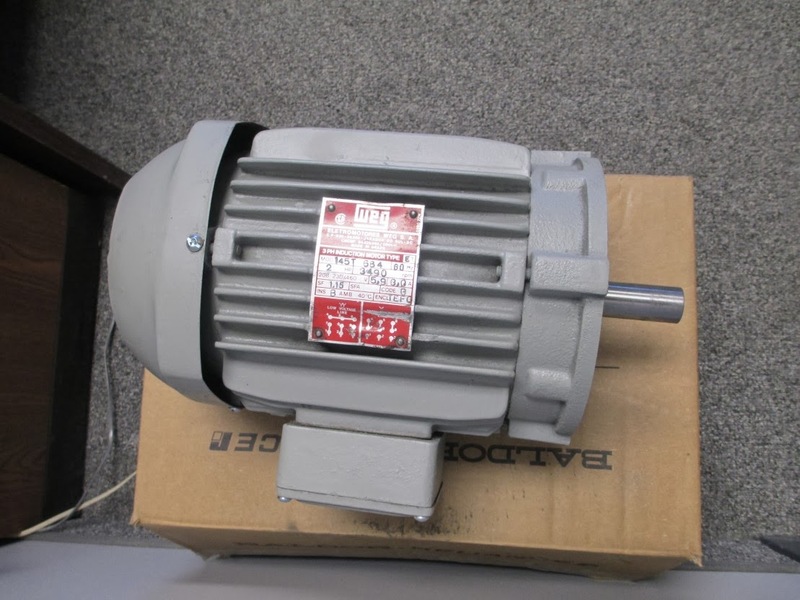 Typically NEMA 56 motors have 5/8" shafts. 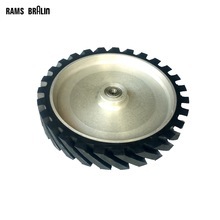 If your motor is a NEMA 143T or a 145T, then grab the wheel set with a 7/8" bore drive wheel. The rest of the wheels are the same only the drive wheel changes. Good luck! Sir, the tracking is killing me. I welded metal around the tracking arm. It helped a lot. but now part E is making it go far left. Causing it to cut into part E and the motor. I moved the motor forward and it stopped cutting into the motor but is still cutting into part E. If I twist part E to the left it will track center but when I apply pressure to the belt in a grind it moves far left again. please help, i have been stuck for two days. Mark, can you send me an email with a few pictures? Send it to knives @ dcknives . com (no spaces). simply phenomenal!! ive been pulling my hair out, just trying to get started (since i salvaged a treadmill motor and decided to tackle this), and then i found your build and plans. thank you so much for this blow by blow walk-through. this is great and much appreciated, the best ive seen online. thanks dude! I hope your build goes well. If you need any tips, chime in. QUERIA AGRADECER POR EL TUTORIAL, TENGO UNA MAQUINA ARMADA GRACIAS A SU AYUDA Y ESTOY MUY FELIZ, GRACIAS POR SUS APORTES . Hi Jake. 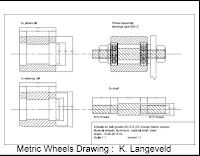 Do you mean the PDF file that was provided to machine the idler wheels? 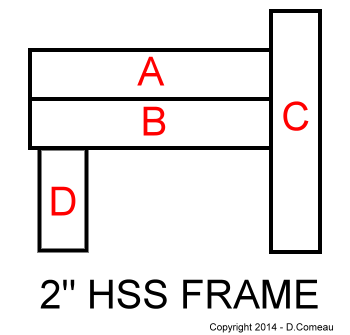 Does anyone have the dimensions of the hollow frame? 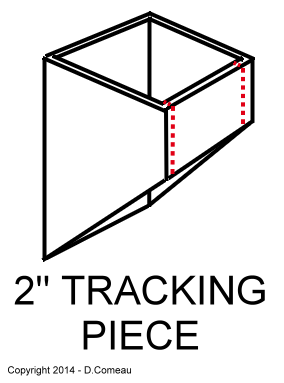 I see where its marked up with letters but I dont see the actual lengths of the 2" square tubing, I must be missing it because no one else has asked for the lengths. Maybe a link to the actual plans? 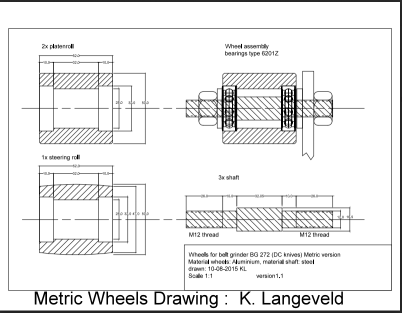 Yes the small numbers beside or inside the shapes on some of the mechanical drawings. 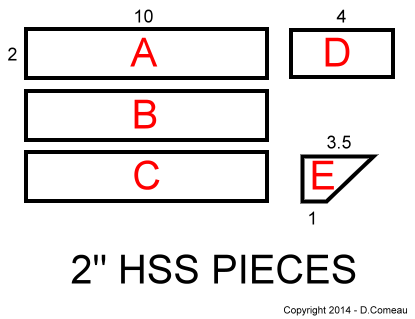 The 2" HSS piece dimensions are: A, B and C = 10"; D = 4" and E is cut on an angle where one side is 3.5" and the opposite side is 1". 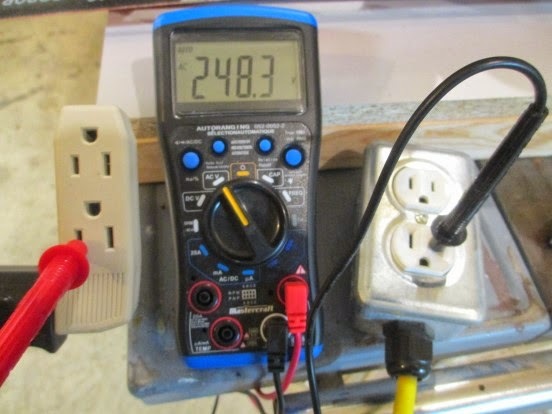 If you move the welded nuts on the 2x2 to engage the top angle of the 1.5 inch,just slightly above it you’ll get a outward and down ward vector, is this a good idea? Changing the position vertically inside the receiver shouldn't be an issue. 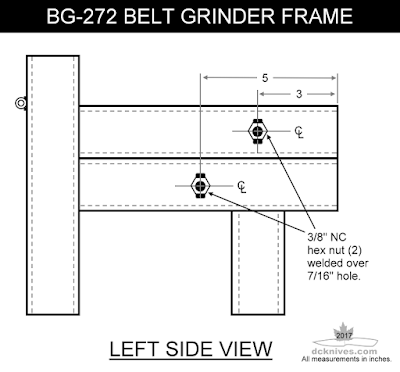 As long as the tool arm is to the right side the belt path and wheels will stay in line. Some guys drill the receiver at the top left corner and weld the nut there at 45°. 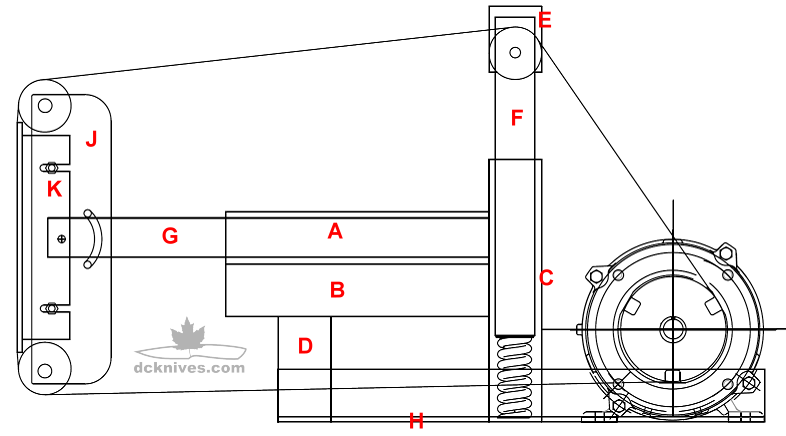 The locking bolt then pushes the tool arm to the lower right side of the receiver. The key thing is that it stays put after alignment. Hello Sir! 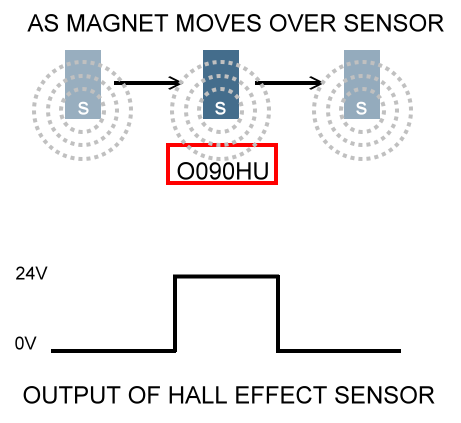 I am having an issue... the shafts of the 3 rollers are heating too much... can you advise me on something? Hi. 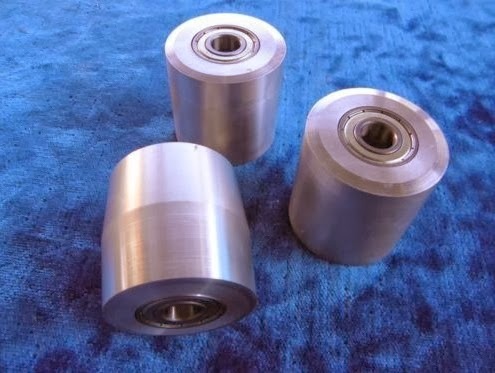 Heating in the idler bearings is usually from overtensioning them. One remedy is to loosen the nuts until the there is a very small amount of play in the wheel as it sits on the bolt and then lock them down. Another solution (which I chose) was to make some spacers that fit between the two bearing and contact the inner race only. These spacers will allow you to tighten the nut and not squash the inner races. These spacers need to be quite accurate in length, but there should be no worry about over tightening them. I made some for my large wheel. You can see how I made a spacer here. Thank you for the quick reply!!! I will try the spacers, I had thought of making them because the bolt needs to be a little tight so the roller is square with the frame and aligned with every roller. A longer belt will run cooler than a shorter belt. I am not sure why but the 72 inch belt seems to have become the defacto knife making standard. Suppliers offer a variety of useful belts from engineered abrasives to conditioning and polishing belts such as Scotch-brite, leather and cork. 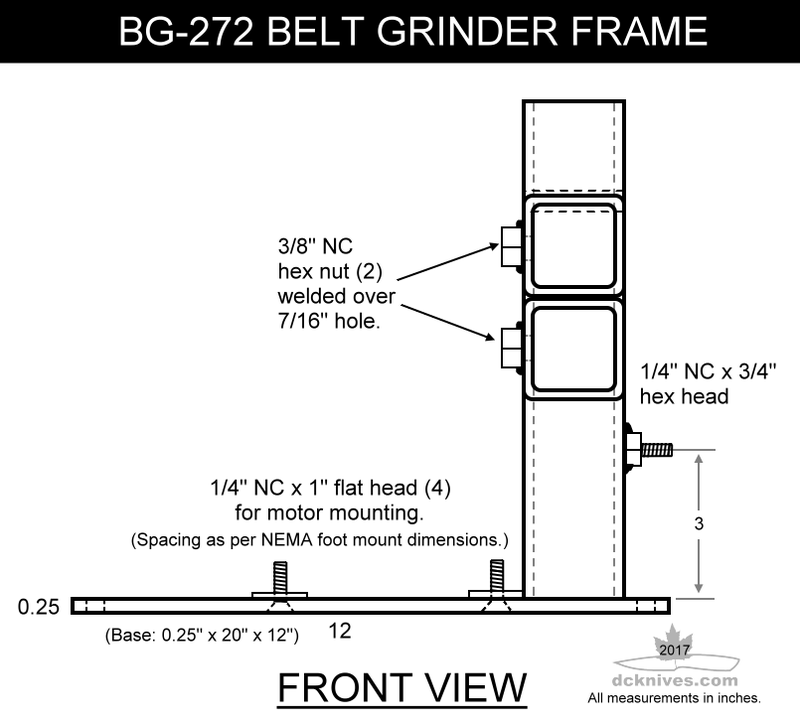 Another advantage of the longer belt is that you can have a larger diameter contact wheel. A 10" diameter wheel can take up a lot of belt, in some designs around 15" or so. I have used 1" x 30" and a 4" x 36" machines and still find them handy. However, these are chronically under-powered for most metalwork jobs. Note that 4" x 36" has the same surface area as a 2" x 72" and generally cost about the same. I have a question regarding the tube size I bought 2" x 2" with 3/16" wall. and 1.5" x 1.5" with 1/4 wall There is alot of play when one is inserted in the other even without removing the welds on the inside. Is this normal or should I buy some 2" x 2" with a thicker wall say 1/4"? This play is fine. There should be about 1/16" gap of an inch all the way around the tool arm. 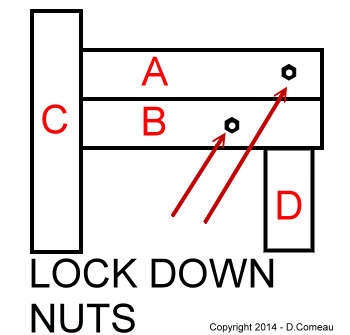 Keep the weld seam on the same side as the lock down nuts. What's important is that when the tool arm (1.5" piece) is inserted and locked down it's pressed tight into the side of the 2" piece. This position should be consistent and repeatable. The gap will be the same inside the vertical receiver. Here I used some thin strips of HDPE (plastic) cut from a thin walled container and epoxied them to the face of the tracking/tensioning pillar. Then I applied a bit of graphite to the surfaces. This takes up the play and allow the piece to move up and down on the spring when required. Hello again, I built this grinder and love it. I am having a hard time with alignment. I have put shims under my motor and the Gap on the C pillar is tough. Where do I put the shims on the C pillar and should it be touching the front right or left. The big question is how do you align all of the wheels. Thanks for your quick reply earlier I have start the build now that I know the gap is expected thanks again. 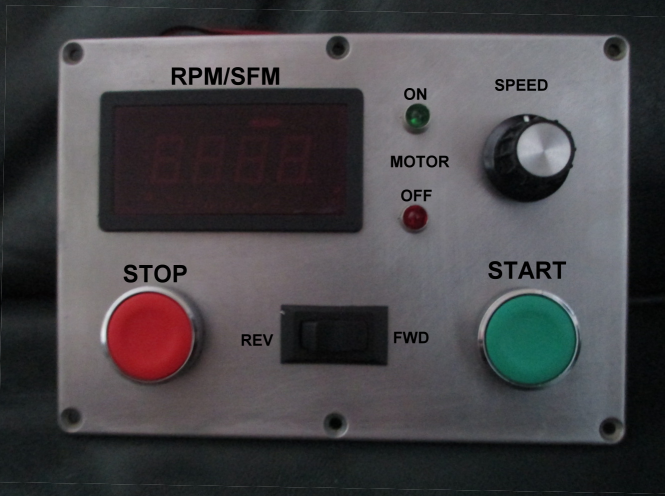 I have just started building one of these and so far so good, I'm just waiting for the wheels to arrive from the states and trying to get some pro advice on motor/ speed control set up. I was just wondering what the 1/8th tube on the side of the vertical tube was for ? I can't find any mention in the text . The tubing is to add a lever for pushing the tensioning pillar down. If you wanted to add this feature later on it would be good to tack a place to mount a pivot before you paint. I made a retrofitted version here. Can you tell me if the HSS steel for the tool arm can be 0.188 thickness instead of 0.250. My local steel store only have 0.188 in stock, should I have them order the 0.250? 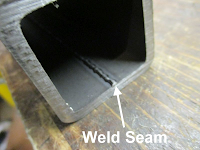 The 0.25" wall provides more threads for the bolt to secure the platen plate. However, if you are careful not to over tighten the bolt, the 0.188" wall will work. Another option is to drill all the way through the tool arm and use a 2" bolt. With this method, the wall thickness doesn't matter much as there is no threading in the hole required. Th belt size is 2" wide by 72" long. I'm not sure if this was addressed already but what purpose does the bottom horizontal tube serve (labeled B on the diagram)? It appears to just be empty? 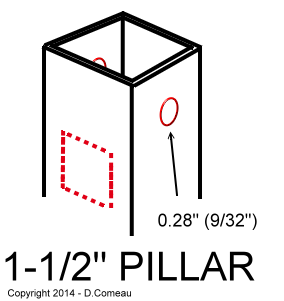 Also what is the total height of the vertical support from base to the top of the vertical pillar? The lower receiver is to put another tool or attachment such as a work rest or light. I use mine mainly for the adjustable work rest while the top receiver has either the flat platen or the large contact wheel. 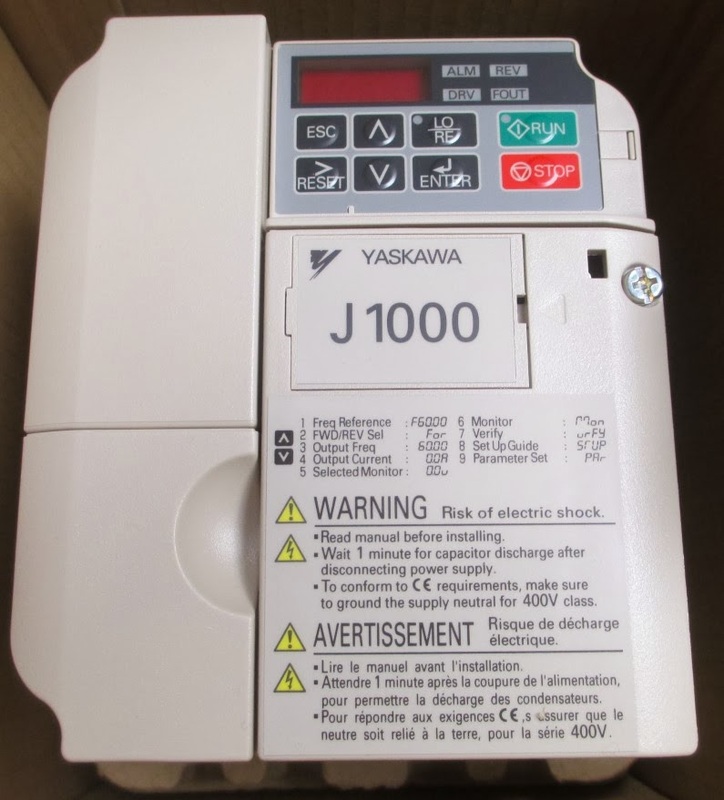 The height of part C (vertical receiver) is 10" (same as the two horizontal receivers.) The tracking tensioning pillar is 13" long. With the spring adding to the height, the top of the tracking wheel sits around 16" tall when measured from the base. I have a 2" on the BG-272. The difference between a 2" and a 3" wheel is only 0.5" in height with respect to the frame. Because the tool arm can slide in and out to take up slack, the design need not change if you have a larger wheel, unless of course it's really large. Common 2" & 3" tracking wheels work fine with this design. I press the tensioning pillar down about 1", slide the tool arm until the belt is tight. Then I lock the tool arm and release the tensioning pillar. My spring seems to not care too much about how far the pillar is depressed, but I've always put about 1" of push on the spring. just completed mine. thanks for the plans!! hardest part was finding the spring for the tensioner arm and getting it to fit into the base just right to avoid tracking issues! My local steel supplier has the 2x.188 steel, but the 1.5 is only 0.125. Seeing as nothing rides inside the tool arm and pillar ( the 1.5 ) do you see any problem with the thinner tube? It won't twist will it? I recommend 0.25" wall soley for tapping the threads through. 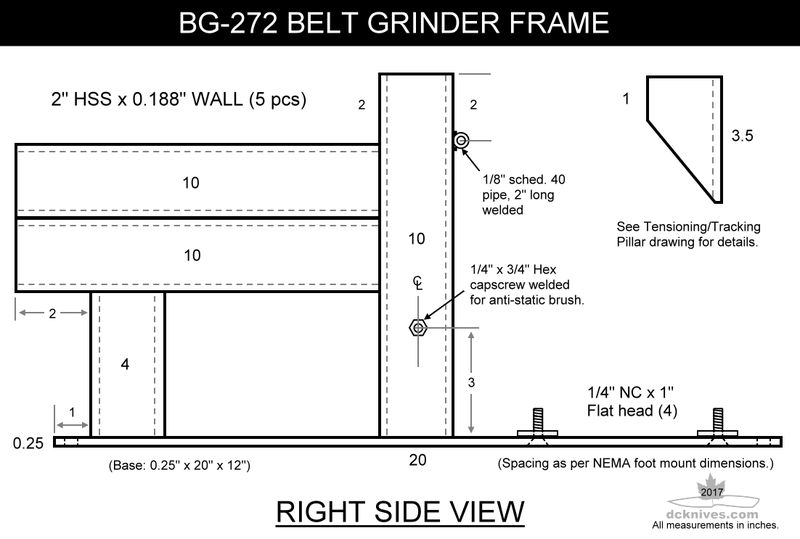 Many have made grinders with 0.125" wall for the tool arm and tensioning/tracking pillar. Simply drill though the tool arm and put the bolts through to secure the platen plate. You are correct in that there is a slight mismatch in my numbers. 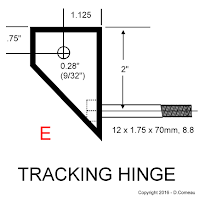 On my machine, the centre of the hinge bolt is 1-1/8" from the right side of the tracking hinge, Having it in 1-1/4" would give slightly more +/- camber on the tracking wheel axle which may be beneficial for those builds that need the extra camber to bring the belt in line. I will update to match. Thanks! I built one of your grinders here and I really love it. I am grinding my own bevels now and will send my first batch of blades off for heat treat this week. In many ways the grinder worked with very little messing around getting my tracking lined up. I think I spent the most time getting the play out of the pillar. It seems like every once in a while something wiggles around there and my alignment changes. 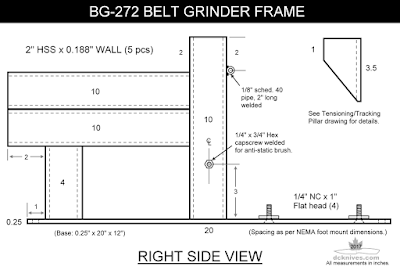 I think I may weld a strip on and grind until things are tight enough. I suppose if I built another one I would use square receiver stock for the frame and hopefully avoid the fiddling around trying to take play out of the set up. I shimmed mine with some plastic strips cut from a jug. Some guys tack some thin gauge steel on the pillar. As long as it can't twist in the receiver you should be ok. 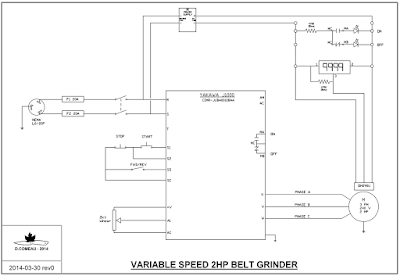 The tension of the belt should keep it firmly in place when it's running.